Brix at Terrell Hills provides investors with a unique opportunity to acquire a141-unit value-add property in a thriving Northeast submarket of San Antonio. Recently rebranded, the Seller also completely painted the exteriors with a new, modern color scheme and replaced the roofs. With the heavy lifting of the exteriors completed, value can be added to the property through interior renovations resulting in immediate upside in rental increases and tenant retention. Conveniently located on the corner of Harry Wurzbach Road and Rittiman Road, Brix at Terrell Hills has one of the highest traffic counts within this submarket combined with excellent visibility, which has historically led to high occupancy. This opportunity is being offered All Cash; Available for New Financing. Brix at Terrell Hills is an apartment community consisting of 141 units located in Northeast San Antonio, Texas, approximately six miles of the downtown area. Built in 1966, the garden-style property is situated on 4.4 acres encompassing a net rentable area of 114,600 square feet. Conveniently located near the intersection of Harry Wurzbach Road and Corinne Drive, the property contains 11 two-story buildings consisting of wood frame construction, brick, stone, and vinyl exteriors, and pitched composition shingle roofs. The community has a unit mix comprised of 32 studio units ranging from 450 to 500 square feet, 45 one-bedroom units ranging from 700 to 800 square feet, and 65 two-bedroom units ranging from 900 to 1,000 square feet, with an overall average unit size of 800 square feet. 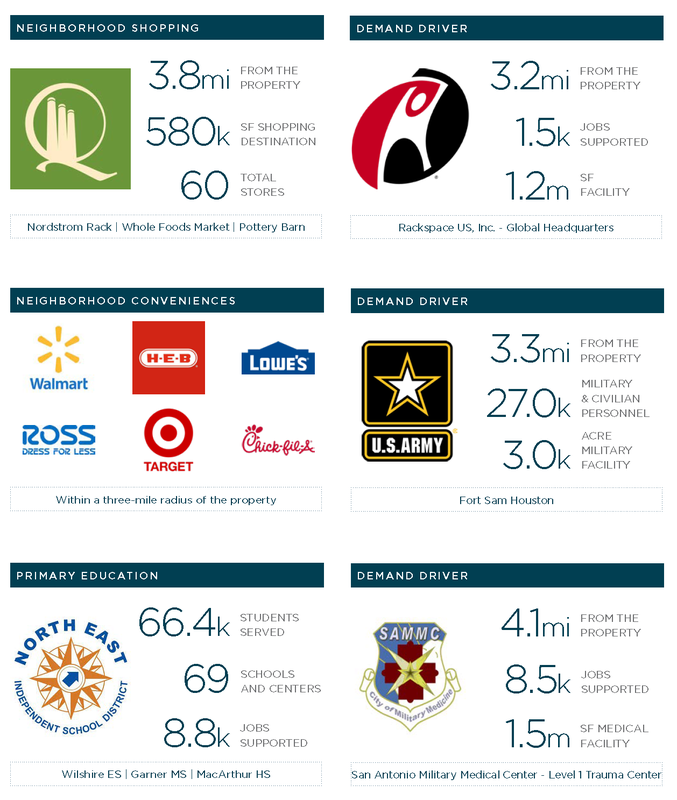 Brix at Terrell Hills is located in Northeast San Antonio, Texas, adjacent to Fort Sam Houston, a 3,000-acre U.S. Army installation, supporting 27,000 military and civilian personnel. Within the Fort Sam post is San Antonio Military Medical Center serving a million annual patient visits. The 425-bed hospital sustains over 60 accredited education programs that include 25 graduate medical education programs and eight nursing programs. 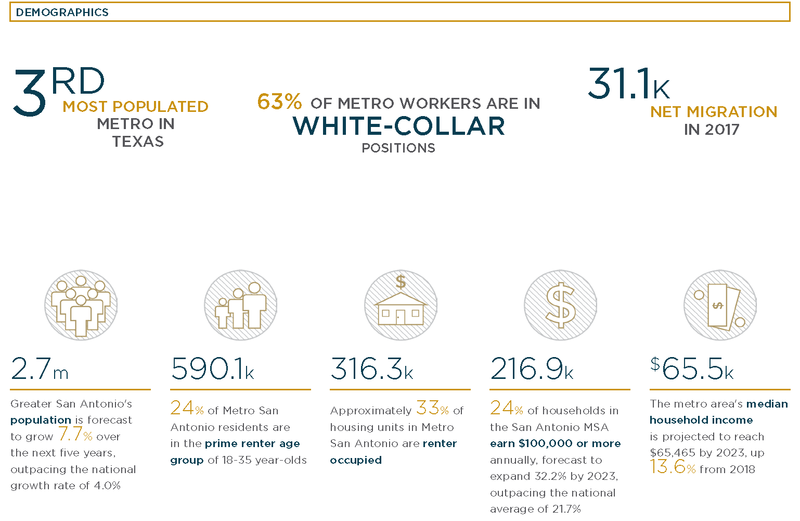 Additional employment hubs within a five-mile radius supporting rental demand in the area include Rackspace’s headquarters, San Antonio International Airport, and Northeast Baptist Hospital. Nearby is the San Antonio Zoo and downtown’s popular River Walk, and urban waterway lined with eateries, shops, public artwork, and other attractions.